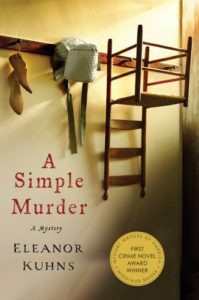 One of the central communities, and the setting for her first novel, A Simple Murder, is the Shaker community in Maine. Sabbathday Lake Shaker Village was the inspiration. We also talked about the religious leader, Mother Ann Lee, who led a fascinating life at the heart of the Shaker movement. Laura Brennan: I’m delighted to welcome Eleanor Kuhns today, author of the Will Rees mystery series. 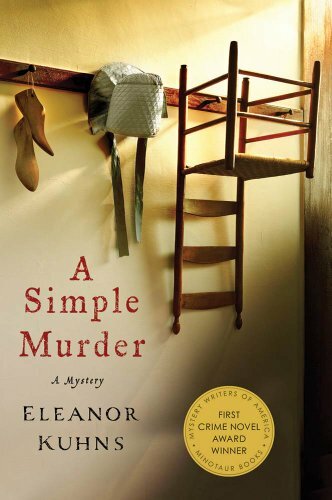 Her debut mystery, A Simple Murder, won the Minotaur Books/Mystery Writers of America First Crime Novel competition. 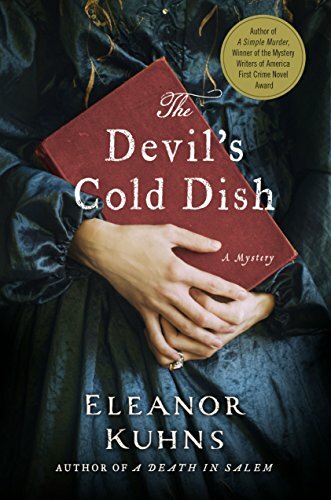 Set in the 1790s, Eleanor’s novels recapture a bygone era — and show how motives for murder never change. Eleanor, thank you for joining me. Eleanor Kuhns: I’m happy to be here. LB: Before we talk about your wonderful series, tell me a little bit about yourself. You’re the assistant director of a public library. LB: So it’s always been books? EK: Absolutely. I started as a page in the Yonkers public library when I was 16, became a librarian, pretty much never stopped working in the library. LB: When did you decide to add to the books in the world? When did you decide to write your own? EK: Well, I always wanted to be a writer. I wrote my first story when I was 10 years old. It was science fiction/fantasy, which was my first love. And every paragraph started with the word “suddenly.” Suddenly the aliens came over the hill. It’s always been all about writing and books. LB: I find that really interesting, that science fiction and fantasy is your first love because that takes place in another world, by definition. And you’ve created really another world for us to go into in your Will Rees mysteries. EK: Well, I think that science fiction and fantasy and historical fiction have a lot of similarities. It is a different world. A lot of times the culture is different, technology is certainly different, but people, I think, remain the same. Historical fiction is, in some ways, easier and harder because the world your writing about is already there, which means you have to have some accuracy as your facts. What did they wear? What was happening in the world? That kind of thing. In science fiction/fantasy, you can pretty much make up what you want to do. So in historical fiction, it’s easier because there’s a structure already to hang your story on, and harder because you have to do a lot of research to make sure that structure is right. LB: Why Maine in the 1790s? EK: Well, at the time that I wrote this book, I was living in Maine. My mother is from Maine, she retired to Maine, and she and a disabled brother were ill. So my husband and I left our jobs and went to Maine. Before we made that huge step, we were traveling from New York to Maine pretty much every weekend to care for them. That’s a nine-hour trip, each way. And the only existant Shaker community is on that route. Sabbathday Lake, right off the Falmouth exit. We stopped there one day, and they have guides because most of the Shaker communities are living museums with interpreters, but people still live there. At that time there were still maybe 10 Shakers living; now there are only two. EK: Only two. Only two left. So they insist on having guides because people are there. So we had a guide who was the daughter of one of the orphans that the Shakers had taken in and raised, which they did right up until 1966. And after we went on our tour, looked at everything, she talked about a lot of experiences of her mother and all of that, I went back to the gift shop and I bought every book on Shakers that they had. And that was the beginning. And I set it Maine because that’s where the community was that I had seen. LB: You were actually interacting with a community that hasn’t changed all that much. EK: Yes. And a very admirable community in many, many ways. In the 1700s, the period I write about, a wife, a widow, would not inherit from her husband unless he specifically named her in his will. If he did not, everything went to the eldest son and she was the responsibility of her son. While the Shakers at that time, men and women, the sisters and the brothers, were on an equal footing. They had equal control in the governance of the community. They were abolitionists, they accepted black people at a time when a lot of them were escaped slaves or considered less than human. They educated both the boys and the girls at a time when illiteracy was, of course was huge, especially among girls. So they were very progressive already. LB: One of the things I thought you did particularly well, each person in that religious community was a distinct individual, not just as a character but in terms of how they lived their religion. There wasn’t like an overlay of, this is what a Shaker is. It was, these are individuals who have this relationship to their particular religion. EK: I really started from the point of view that everybody would have come to it from a different place. Some people came for protection, some people were running from something, I think some people really did a religious conversion. And someone like Mouse, again, an outsider, what other option, in a way, did she have? This was time when the only path for a woman with marriage. You have someone with a physical challenge, she doesn’t have a dowry or anything with which she could afford to, in effect, buy a mate. So she would go to the Shakers, not because she didn’t necessarily believe or wasn’t religious, but because this is a community that offered her a job, a family, a future, everything. So I think that when I was creating this world, what I really did was think about how the people themselves would have been brought to this community. So I didn’t approach it from, well, this is a religious community, so everyone here is religious; I looked at why the people came there in the first place. And I think that the Shaker community, you would have had, probably, murders and things like that because they took in everybody. And, you know, you’re always going to get a few apples that are not so good in the barrel. LB: Well, that leads beautifully to my question about Lydia. Lydia is a very headstrong woman the time when women didn’t have a whole lot of political power. I was thinking about it and the actual person she reminds me of most is Abigail Adams; she’s someone who very much has a mind of her own. So really that community would have been a refuge for someone like her. EK: Absolutely. And Lydia is an interesting character because I did not intend for her to become the strong, primary character that she became. EK: She was one of those people who just leapt off the page and kind of took over. LB: Oh, yes, she’s tremendous. Let me, actually, let me just go back a little bit and talk about your primary character, who is Will. He is an outsider in the Shaker community in your first book. EK: He, in my opinion, is kind of an outsider everywhere. He becomes more of one, I think, as he goes along. Because one of the things that I learned living in a small town in Maine, is if you grow up in a little town where there are only a couple of hundred people — and I worked as a librarian there so I actually saw this happening — they never let you forget what you did as a child or as a young adult. You are never not that person. So I included that in the book. That Rees, who was an angry little boy, never is allowed to be someone different. So he’s an outsider even in his own hometown. He’s more of one in the Shakers, which in some senses is a community of people who don’t fit in elsewhere. And I hope at some point to write about Lydia and her background and her family, and what brought her to the Shakers in the first place. I didn’t realize it, but in a lot of ways I think I write about people who are outsiders in one way or another all through the series. And it took me until five books before I realized that. LB: You mentioned how Lydia was someone who you didn’t expect to become as big a character as she is; was the same true of Mouse, or did you always know you were going to bring her back? EK: Well, I didn’t know at the end of A Simple Murder that I was going to bring her back, but I had so many letters about Mouse. LB: Oh, I love Mouse. EK: Yes. So that’s why in Cradle to Grave, I put her into trouble. Mouse is fairly strong-willed in her own way, wouldn’t you say? EK: And she has a really passionate sense of right and wrong, which doesn’t necessarily always agree with the Shaker community that she lives in. And Mouse has always wanted to be a mother, understands that that’s probably not ever going to happen for her, so she gravitates to children. And to problems with children. So it made sense to me that if there were children in trouble, the first thing she’d want to do is rescue them. That’s where that idea came from. LB: And the book we’re talking about now is Cradle to Grave. EK: Right. The other thing I wanted to write about was, in effect, the gender roles of that time. Where you have Maggie, who all she really wants is to have what other women of that time had: a husband, a family. And she really doesn’t have a good path to that, so that in a sense she’s living outside the sexual morals of that time. And she’s pretty heavily punished for it. So I also wanted to include some of that, because I wanted to write fairly evenhandedly about somebody on the one hand who is very, considered wicked. She’s an alcoholic, and she can’t really care for children as well as she should, and there’s been a succession of men. On the other hand, she’s really struggling. She wants all of those things, but every time she tries to achieve it, she is unable to for one reason or the other. LB: Yes, she’s a fascinating character. So you also give us a glimpse of what life in the new country — what do we call this? Do we call this Postrevolutionary…? EK: I’ve heard it described as the Federalist Period, but I’m not sure that really describes it exactly. It’s right after we’ve become the United States — and barely the United States at that time. LB: They have jobs that do not exist anymore. For example, Rees is an itinerant weaver, which I did not even know was a thing. EK: Well, when you think about it, his job ends in the early 1800s, because of the Industrial Revolution. But up to that time, spinning and weaving were some of the most important jobs that there could be. People would not have had clothes at all if those jobs had not existed. Women — and of course ‘spinster’ comes from spinning, because every woman pretty much spun — that was an ongoing job. But looms were very big, very expensive, and even in England, you had to apprentice for seven years to learn how to be a weaver. It was not the easy job. And if you were going to go from farmhouse to farmhouse, where the wives did not have a loom, well, what else would you have? You would be a traveling weaver. LB: It’s so much a part of his character, it’s so much a part of who he is. Did you come up with Rees as a full character and then find a job for him, or did that happen in tandem? EK: Well, I have a loom. LB: Oh, no you don’t! EK: I do. And I weave. Well, I used to, before the books took off. I know how to spin, I have a hand — a spindle. Several spindles, actually. I’m very much into textiles and fiber arts. And one of the things I do as a librarian is I do a lot of programs. Libraries do a lot of programs now, and a lot of mine are, ‘Learning to Dye,’ ‘Learning to Weave,’ ‘Learning to Quilt,’ ‘Using Natural Dyes’ — all of this kind of thing. So I already knew what his job was. The other part of it is that he is based fairly loosely on my father, who was — they don’t call men craftpersons, but he was one of those people who could do anything with his hands. He was a sign painter, he was a contractor, he did all of these kinds of jobs. And I wanted in a way to pay homage to a time when most people had to work with their hands. We’ve really gotten away from it to a large degree. But I think 200 years ago, everybody did it and it’s really a vanishing skill set. And I think we should be very sorry to lose it. Not necessarily the weaving, although I belong to a weaving group, but all the crafty hand things that people don’t do so much anymore. LB: No, I absolutely agree. I think there’s great value in being creative — as in actually creating something tangible. EK: Yes. Exactly. And the library has an ongoing yarn gang, we teach people to knit and crochet, and a lot of people come to these things I think because they’re looking for something where they can create something tangible. Where they can actually see it at the end. In The Devil’s Cold Dish, I wrote a scene that for any weaver would be absolutely heartrending. And I don’t want to necessarily give it away, but it is so heartbreaking for Rees. LB: Let’s actually talk about that, that is the most recent book that has been released. I know you’re working on another one, and I want to talk about that. But that is most personal story for him so far. Was it just time to torture him a little more? How did you come up with that one? EK: Well, you know, I knew since Death of a Dyer that I was going to have to address this whole issue with his sister. And I felt, I wrote that partly because I feel that relationships with your family members can be even more angst-ridden and difficult than relationships with your significant other. Family, sisters and brothers, and all the history and the baggage and all of that can be so difficult to navigate. But after the events in the Death of a Dyer, I took a couple of books to try to decide what to do. I mean, how am I going to wrap this up? We already knew from several of the other books that he was an outsider in his town and that there were other things going on. So when — and of course Lydia, as a Shaker, would have been very suspect. Mother Ann Lee, who was the spiritual heart of the Shakers, was actually arrested in New York in 1783 and charged with blasphemy. So, you know, witchcraft was still believed in and women were still at risk. She would have been a very good target in a sense, because that was a way you could really get to Rees, even more than going after him. So I started thinking about this, and I had done all this research in Death in Salem, and of course the witch trials were too early, but everything in Salem circles around the witch trials. Most people are very shocked to know that the last trial, witchcraft trial, took place in New York in 1816. I think most people assume that once the Salem witch trials were over, the whole issue was over for this country. And that is not true at all. The Shakers, although they weren’t outright accused of witchcraft, were accused of blasphemy because their culture, their community, the way they believed that God was a mixture of male and female, was so antithetical to the religion and the culture at that time that they’ve course made themselves in a sense targets with their beliefs. And they were pacifists, that was another issue. So I find that the accusations of witchcraft and all of that really kind of shine a light on some of the worst facets of human nature. The thing that kept coming to me is, how do you survive something like that? How do you survive having friends and neighbors, family members turn on you? So it all came together and became The Devil’s Cold Dish. LB: Well, I think it’s fascinating and that this is a new country that has specifically been founded on religious freedom as one of the important tenets, and yet people are persecuted for their religion. EK: Yes. Exactly. I think we’re a very tribal species in a lot of ways, and it’s very difficult to be the other. LB: And yet that is what you write about. EK: Yes. Well, because I think it’s fascinating. In Death of a Dyer, I kind of hinted that two of my characters were homosexuals and in a homosexual relationship. That was against the law then, and you would have been jailed if they were humane and hung if they were not. I mean, there’s so many ways to be different. LB: Let’s talk about your next book. EK: The next book, of course, the whole family has fled to the Shakers for refuge. So the next book, which I’ve tentatively titled The Shaker Murders, take place in the community after Rees and his family are there. So he’s hardly had a chance to even get his head straight and he’s already thrust into another murder. And while they’re living with the Shakers, and trying to figure out what their next step is, then I going to the next book in which I research wolves and climate and Maine weather. I guess at the end, I’ll end up knowing a lot of little stuff about a lot of things without totally being an expert in anything. LB: Your blog reflects that. LB: You talk about all sorts of things. What I love is that you always relate them to the past; you draw the parallels between what has gone before, whether it’s presidential elections or a failed crop. EK: Well, I think that in a lot of ways, for a lot of us, what really happens to us in our daily lives? We still have to work, we still have to support ourselves, we still have to eat, we still have to raise our children. I try to include that because I think someone like Sherlock Holmes is almost an anomaly. He has the ability to not really think about anybody but himself — unless you read, of course, Mary Russell, in which he has a wife — but he doesn’t have children. He has a job as a consulting detective. What about the people who are trying to work, raise families, live a normal life and still trying to do this, too. So I tried to include some of that, because I feel that, especially farming, is very labor-intensive, and even now living takes a lot of time. There’s a lot of maintenance that goes on. And it must have been so much harder in the past. So much harder. And I’m actually fascinated by all the things that we don’t know. Like, I did a whole thing on wagons and wheels and the development of wheels and that all is going to end up in the next book actually, because it was germane to the plot. There is so much that we have lost because it’s 100 years ago since we’ve had wagons drawn by horses and we don’t know anymore how that technology works. So I find it all fascinating. I don’t know if people who read my blog are as interested in some of the stuff is I am, but I always put in stuff that fascinates me. LB: I’m sure they are. I certainly am. Let’s tell them where they can find you and find your blog. So your website is Eleanor-Kuhns.com? LB: And they can get to the blog right from there. EK: Yes. It’s just a tab. LB: Eleanor, thank you so much for joining me. EK: Thank you for having me. As I said, I always enjoy talking about my books. As you can tell, I’ve thought about them quite a bit.